If you have been keeping up with me on Facebook or Twitter (@mirva08), you may have noticed I’m currently in Nicaragua, my country number 62. After a brief 10-day stint in Costa Rica, I’ve now spent about five weeks exploring the “Unique and Original” Nicaragua, as the tourism authority’s new slogan goes. My friend Mira and I even managed to get ourselves featured in a local online magazine promoting Big Corn Island as a tourist destination. See how cozy I look in that hammock? Being back on the Central American isthmus has got me thinking about quite a few things – including the last time I was here on these latitudes, in 2011. 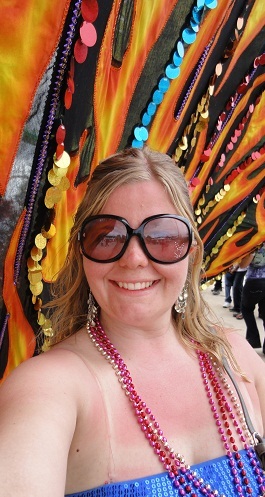 Back then I did a 3-month tour of the Caribbean and Central America, starting from the wild carnival in Trinidad and Tobago (which is actually going on right now! ), and continuing onto Guyana, Jamaica, Cuba, Mexico, Belize and Guatemala. While I had some fun times in all of those countries, I felt a closer connection with only a couple of them. I have since then wondered many times why some places “click” with you so well and just feel right, while others don’t. 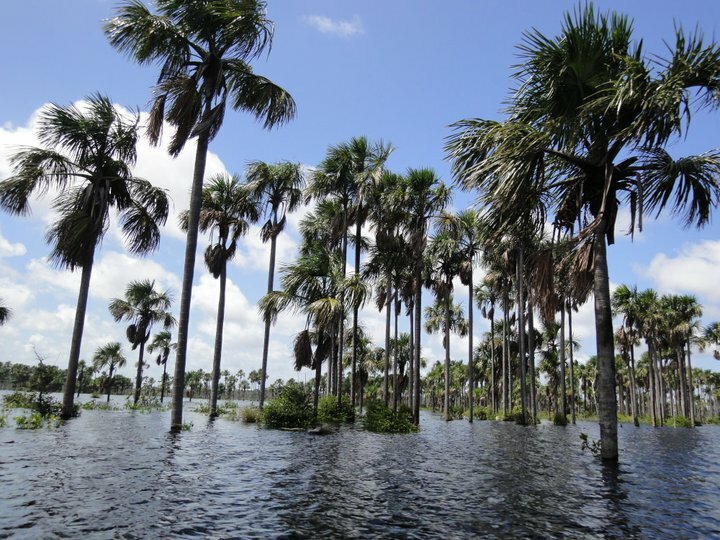 I first became intrigued by Guyana when I traveled around South America in 2008. At some point during my 5-month trip I looked at the map and saw this relatively small country next to Venezuela that I realized I knew nothing about! I asked other travelers I met along the way if they had been to Guyana, or were planning on going. The answer was always no. Nobody seemed to know anything about this place, and even the Lonely Planet has no guidebook for the country. It was obvious that I needed to go check out whether Guyana actually exists and what goes on there. My opportunity to visit came up pretty unexpectedly in 2011. 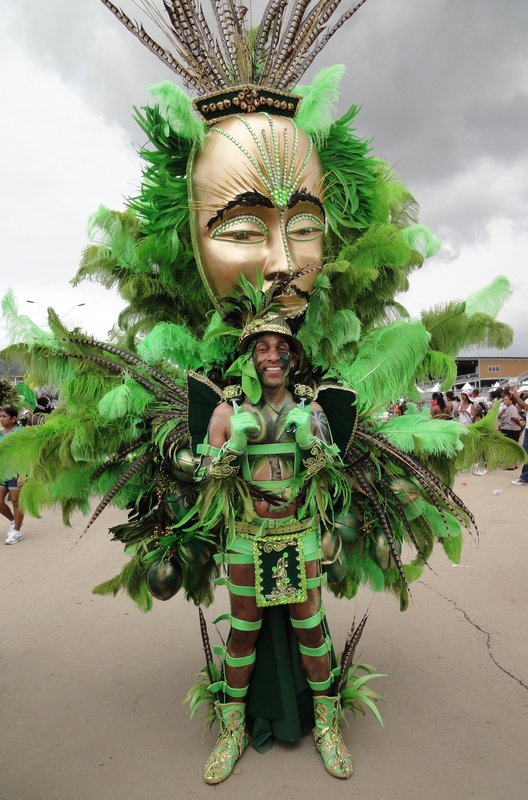 Once carnival in Trinidad was over, I was trying to figure out where to continue next. I then noticed that I could buy a one-way ticket from Port of Spain to Georgetown, Guyana’s capital, for $160 on Caribbean Airlines. Not bad! I found the ticket at 10 p.m. and the departure was at 6 a.m. the next day. I figured that if I skipped sleep for that night, I could do laundry, pack up my bags and be ready to head for the airport at 4 a.m. Sold! As soon as I boarded the one-hour flight from Trinidad to Guyana, I knew I had stepped off the beaten path. The plane was only about a third full. Most people on the plane seemed to be locals, and were of Indian descent. 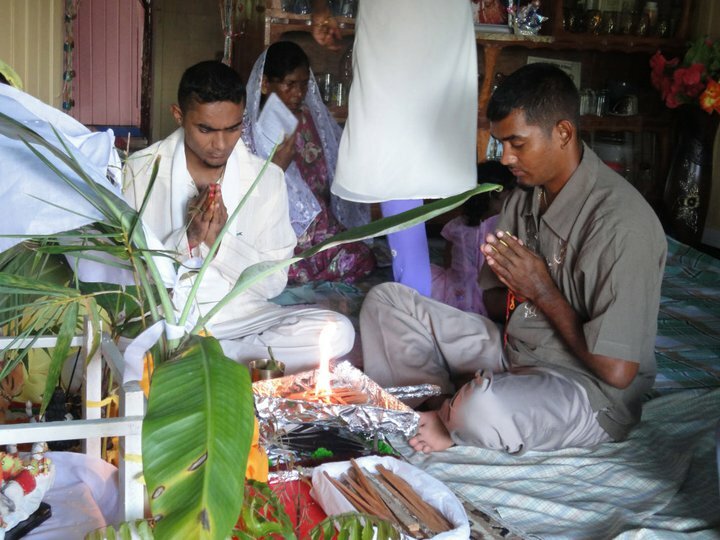 Some 60 percent of Guyanese people, I later learned, have their roots in East India. Their ancestors were brought to Guyana as indentured servants back in the 1800’s when the English ruled the country. The rest of the Guyanese people are a mix of black people (40 percent), white folks, Native Americans (called Amerindians there) and something in between. 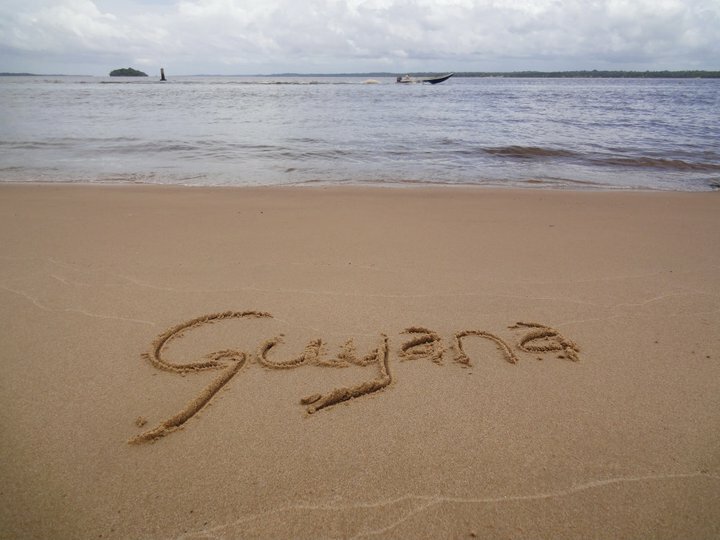 Guyana is the only English-speaking country in South America, though the English there is of the Caribbean variety and very hard to understand (at least for me…). On the plane I struck up conversation with a Guyanese man living in Canada, and got lots of good advice on where to go and what to do. He also offered to give me a ride to the center of Georgetown as his wife was about to pick him up at the airport. Sweet! Much to my dismay, my arrival into the country wasn’t as smooth as I had hoped for. Having bought my ticket at such short notice, I didn’t have a plane ticket out of Guyana yet. And I didn’t know if I even wanted to buy one, as the man on the plane had told me I could take a bus to Suriname or to Brazil, and go from there to Venezuela. But Guyanese immigration officials didn’t think that I should have the luxury of deciding my travel route on a later date. The serious and strict-looking ladies told me that I had to buy a ticket out of the country right then and there, or I was going to be flown back to Trinidad & Tobago. Blaah. Where’s your carnival spirit, people? With immigration officials giving me a bad first impression of the country, I quickly decided to just stay for 8 days. I figured that if Guyana was as unwelcoming as its immigration officials, I didn’t want to waste too many of my precious travel days there. So on a whim, I bought a $300 ticket to Jamaica for the following week (a semi-random choice: I was heading to Cuba and figured that Jamaica was on the way). After finally clearing customs I was lucky enough to run into the man from the plane who had offered me a ride to town. He was still waiting for his wife to come pick him up. That was great news for me, because it turned out my ATM card didn’t work in the airport’s cash machine and I couldn’t get any cash out (always a nice feeling in a foreign country, eh!). Catching a cab to the center of Georgetown would have thus been a challenge. So my week in Guyana started with the friendly couple dropping me off at Hotel Tropicana in the center of Georgetown, and it ended up being quite an interesting eight days. The time actually felt more like three weeks, and included a lot of highs and lows. The lows were mostly due to feeling pretty lonely at times: it turned out I was the only guest at my hotel and that there were barely any other travelers in the whole country. 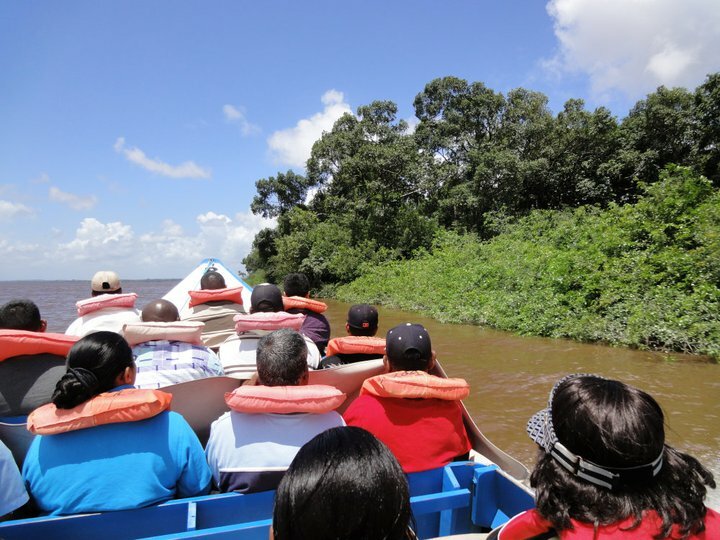 Guyana receives only about 100,000 international visitors per year (compared with Jamaica’s 600,000), and of those only 5 percent are coming strictly for tourism purposes. The great majority come for business conferences, to do volunteer work with NGOs or to visit family or friends. Thus I got stared at a whole lot wherever I went, whether it was onboard a river boat crossing the Essequibo, South America’s third largest river, or visiting the local market in Georgetown. Walking around Georgetown and looking at the white wooden Victorian houses, surprisingly many of which were beautifully renovated, I felt like I had been tossed back to the 1800s. I was in this country that everyone had forgotten existed. There were at times more donkeys on the street than people. No wonder I had never met anybody that had traveled to Guyana. The place was empty! At least this was the case on a Sunday afternoon. On Monday the city’s pace picked up a bit, but it was by no means a buzzing metropolis. The highlights of the week were plentiful, though. Through some contacts from the traveler’s networking site Couchsurfing.org I got to know plenty of locals, and got to witness a Hindu ceremony and an Indian wake (referring to the night before a funeral. The deceased person’s friends all get together to eat, chat and play Dominos). Some of my new pals organized for us to go visit an Amerindian village nearby Lake Mashabo, which was an incredibly beautiful lake with palm trees growing out of it! I couldn’t believe my eyes. Can trees grow out of water? I hadn’t thought so… And later on I heard it was actually an artificial lake and that the trees were dying little by little. Boohoo. Over the week I got invited to stay in local houses in the town of Bartica and the Essequibo Coast and tried various traditional Guyanese-Indian foods. My favorite was smashed pumpkin with roti, the fluffy Indian flatbread. I also tasted some really tasty chicken curry. One of my favorite meals was lunch at Coalpot, a small restaurant in Georgetown where you could pick and choose your favorites from a selection of Indian and African dishes, with mashed potatoes and macaroni pie thrown into the mix. The total price for the meal came to about $4. 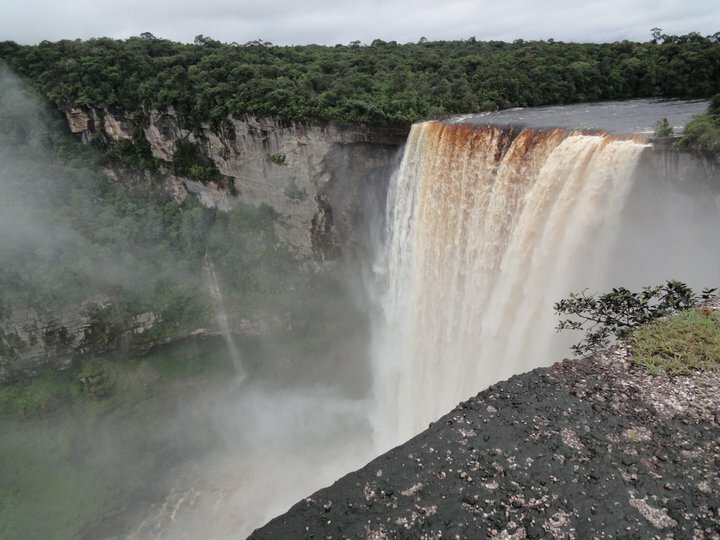 Overall Guyana isn’t a cheap traveling country though, even if it is the poorest in South America: accommodation starts from $15-20 for a basic room. But considering all the offers I had to stay with my new local friends, the price of accommodation wasn’t really an issue. A bigger problem was the price of doing excursions and sightseeing. Now THAT is expensive in Guyana, mostly because there aren’t that many tourists and thus there’s no competition between travel agencies. 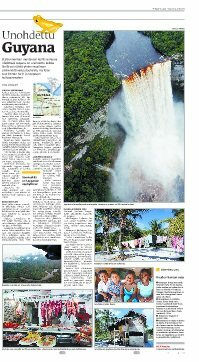 Day trips to the Amerindian villages and nearby monasteries start at $150 per person, and a tour to the Kaieteur waterfall, one of the world’s biggest single-drop waterfalls, costs a minimum of $195. That’s because it’s located in the middle of the country in the dense tropical rainforest, and you have to fly there on a small plane. Going by land would mean driving a couple of days on bumpy roads, and then trekking for three days through the woods. Since seeing Kaieteur was one of my biggest incentives for traveling to Guyana, I decided to splurge on the plane ride. But I soon found out that the price of the trip wasn’t the only problem: another one was the scheduling of it. None of the tour companies knew whether they’d have a trip going all week. It would all depend on whether other tourist would show up and sign up for the flight. Considering I hadn’t seen any other travelers during my time in Georgetown, I didn’t have high hopes of this happening. In the end they did get a group of 9 together (comprised of people working with NGOs or visiting friends in the country), but it wasn’t until my last day in Guyana and the price was $270 instead of $195. 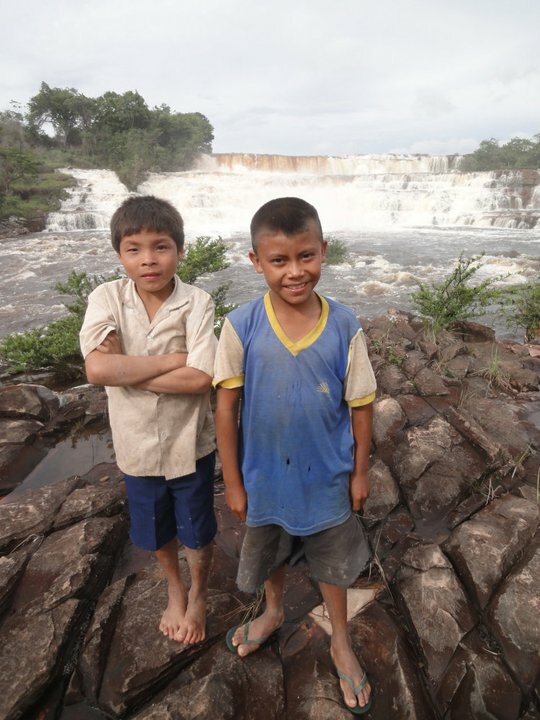 This was because the tour also included a visit to another smaller waterfall in Southern Guyana, near the border of Brazil. I decided to go for it anyway, even though this meant largely missing out on the colorful Indian Holi celebrations that were the same day (or Phagwa, as it’s called in Guyana). And I’m super happy that I went for it! It just might have been the best $270 I ever spent. The whole day was pretty surreal, but the most amazing sight was flying over the solid green rainforest for an hour and suddenly seeing the huge Kaieteur waterfall pop up in middle of it all. 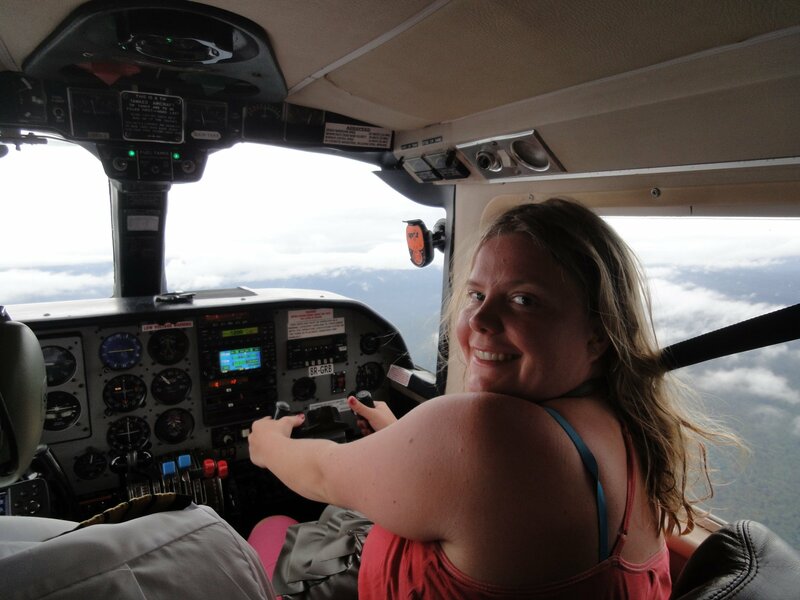 Our little 10-seater plane (where I got to be the co-pilot!) circled above it for a few minutes, and we could see the masses of water falling down to the bottom of the valley far underneath. Whoa! The drop is a whopping 7000 feet. Venezuela’s Angel Falls is of course higher, but that one is actually several waterfalls falling down simultaneously on top of one another. So as far as single waterfalls go, Kaieteur is the king. We landed on its tiny airstrip and went to admire it from several viewpoints. Next we flew to visit (and to take a shower in!) the other more humble waterfall, Oruinduik, near the border of Brazil. There we got to meet some Amerindian kids. Apparently they always paddle over from the Brazilian side by kayaks when they see a small plane like ours arriving (which the guide said happens about once a week. Kaieteur gets more visitors than that, but most people don’t bother paying for the Oruinduik leg of the trip). The kids come over mostly for the joy of seeing some new faces in their isolated surroundings, but also in hopes of candy, food or some change. There were about six or seven kids, along with an older woman who was holding a baby. They stared at us in a shy but friendly manner. The girls all had long black hair, one of the boys had almond-shaped eyes. All had small holes and stains in their clothes, but were otherwise looking pretty sharp considering they live hours away from the nearest big town. Needless to say, my time in Guyana was truly memorable and still brings a smile on my face. After just a few days there, I could tell this was a place where I felt right at home, though it looks nothing like my home country on the outside. There’s just something about Guyana that clicked with me. Do you remember visiting a country that just felt right to you? What do you think it was that made you feel this way? Hey people – it’s CARNIVAL time!! This year Feb. 20 and 21 are the official Catholic carnival dates. 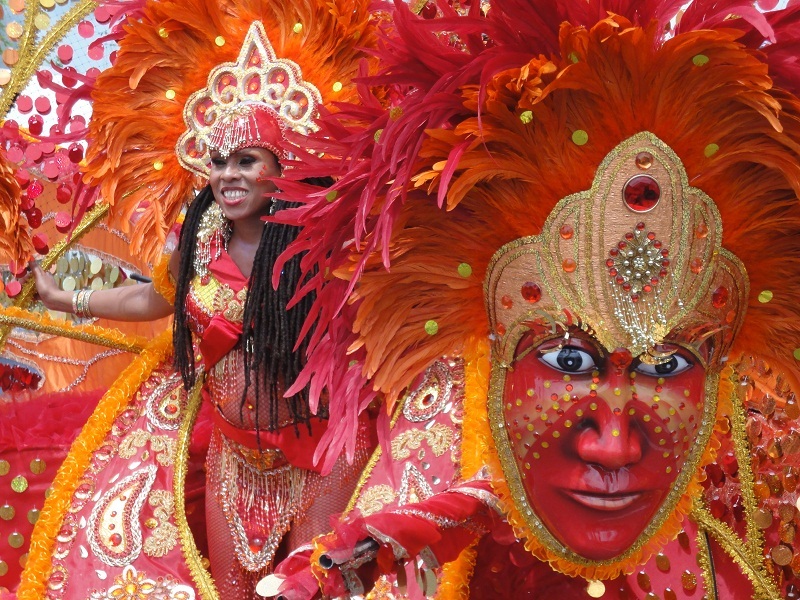 So the party is on in the ultimate carnival nation, Trinidad & Tobago! I can almost hear the music blaring from the loudspeakers of the trucks and see the Trinis shaking their hips in unison. The year’s most-awaited fiesta is finally here! But of course the emphasis here is on the word almost, as I’m nowhere near the Caribbean at the moment. Instead I’m sitting in the peace and quiet of Dakhla, an isolated town in Western Sahara. There’s no music to be heard, and not a single dance club in town. Instead there are countless cafes serving only non-alcoholic drinks and a nice ocean breeze blowing over to the beach boulevard from the turquoise bay. Whereas in T&T hoardes of women are currently prancing around in skimpy bikinis, here the ladies are covered head to toe with colorful fabrics. But this stark contrast shouldn’t stop me from reminiscing about last year’s carnival, and telling you about it! After all, T&T’s carnival is something everyone should experience at least once in their lifetime. Now that carnival and all the craziness is officially over, it’s time to look back and figure out what exactly happened during that whole week of non-stop action. If there’s one thing I’ve learned, it’s that nobody takes carnival as seriously as the people of Trinidad. It’s been said that Trinis are either celebrating carnival, talking about the last carnival or planning the next carnival. I don’t have any doubt about that being true. After all, I met a person who had spent US$2,000 on their carnival costume and party tickets, and another one who had spent US$1,200 on flight tickets to be able to fly to Trinidad for a day and then fly back to the US for work the next day. I also witnessed some 80,000 people taking part in the carnival processions. Whereas in Rio de Janeiro most people watch the carnival show from the comfort of their Sambodromo seat, in Trinidad they say 80 percent of the people actually take part in the show, and only 20 percent watch it. “Are you playing mas?” was the most popular question of the week, as was “Which band are you playing with?”. It took me a while to figure out that playing mas with a band had nothing to do with playing any kind of an instrument with a live orchestra. “Mas” refers to masquerading, and “band” refers to a set of trucks that have huge loudspeakers on them blasting music as they roam the streets. Some of the popular bands include Tribe, Yuma and Island People. Apparently there are slight differences in the types of party people each band attracts, but costume- and music-wise they all seemed very alike. 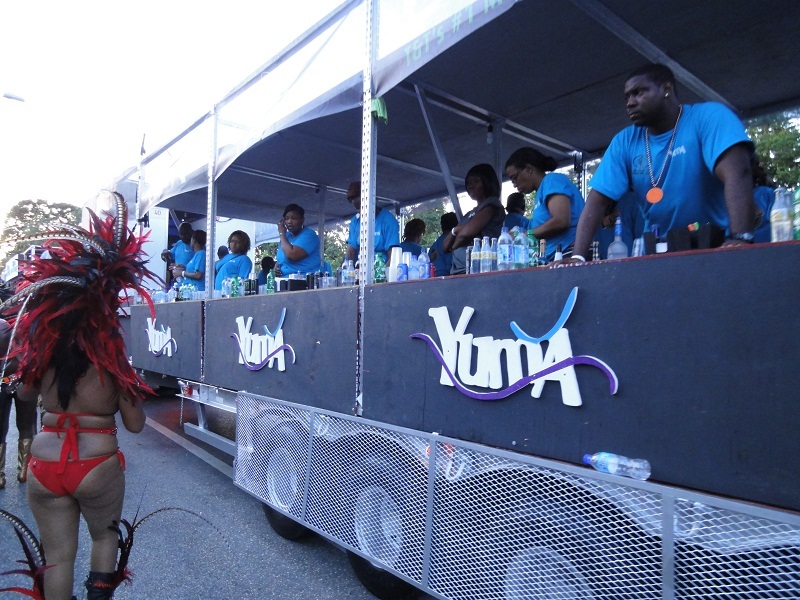 The same Soca hits, the same colorful feather outfits and the same drinks (anything with Red Bull being the favorite). But people still seemed very patriotic towards their own group, which for my friends was Yuma. 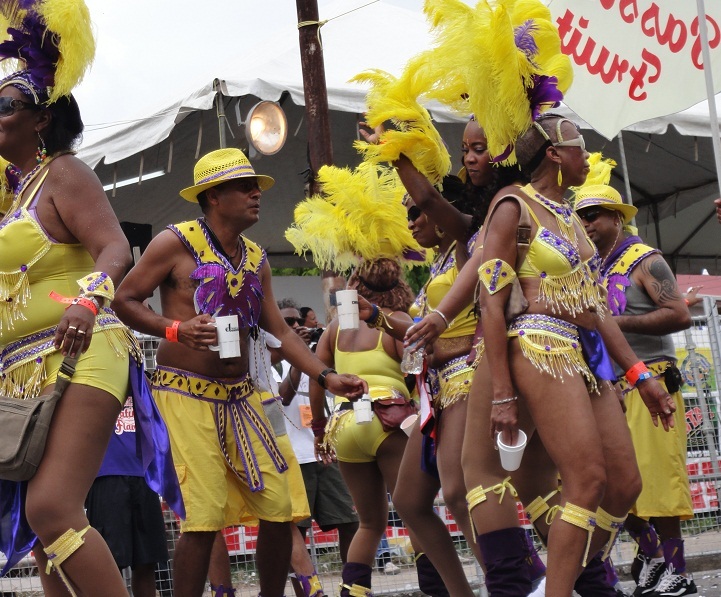 Those that choose to play mas will thus don their skimpy outfits and dance next to a particular band (group of trucks) on Tuesday, the official carnival day. The highlight of the day is “crossing the stage” with your group, the official carnival stadium in the center of Port of Spain that was built a couple of years ago. One of this year’s biggest Soca hits, Machel Montano’s Advantage, talks specifically about the excitement of crossing the stage: “The stage is in front of us, time to take advantage of it!”. The previous day, Monday, is a “training day” of sorts when people wear their band’s signature T-shirt and shorts and follow the trucks for miles on end. Much to the surprise of many, I had decided not to play mas. “Why would you come to Trinidad and not play mas? That’s the best part of carnival!”, people asked me. My answers varied from “I don’t feel like squeezing into a skimpy costume” to “I don’t have the energy to walk 20 miles after a truck” and to “I’d rather watch you guys from the audience.” The truth is that I just couldn’t justify spending $500 to “play mas” (nor did I have an extra $500 lying around anywhere!). Yes, you read right – five hundred United States dollars! That’s how much the tickets were for the two official carnival days, if you wanted to play with a band. The price included free drinks for the two days (from a moving truck that doubled as a bar), the band’s t-shirt and shorts, your skimpy carnival costume for Tuesday’s show, and a boxed lunch both days (a simple chicken and rice meal, served cold and often hours late). Call me a cheapskate, but that to me sounds like a rip-off. Someone is making big bucks off the Trinis’ love for their biggest national holiday. A more reasonable price would have been $250, and even that would have still been way more than what I’ve ever paid for an all-inclusive party in New York. Granted, someone had to pay for the trucks and the security people, but the price still seems pretty steep to me. However, most Trinis seemed to think that paying $500 for two days of partying was a decent deal (never mind that $500 is the average monthly income in Trinidad, when all social classes are taken into account). And the remaining people must have thought that even though it isn’t an amazing deal, so what? It’s carnival! Time to splurge and engage in revelry! Take the skin off my back and sell my grandma’s house if it guarantees a good carnival! Personally I think I got the best deal, and I didn’t mind missing out on crossing the stage on Tuesday. Quite the contrary, I was happy I didn’t have to get up at 5 a.m. to put on my make-up and costume, and then walk for 20 miles in the heat and try to keep up my party spirit until 10 p.m.! And this was after at least four days of partying, as the two official carnival days are preceded by a week of celebrations. While it seems like every self-respecting Trini needs to play mas at least once in their lifetime (or preferably every year), I would recommend visitors to skip out on paying the $500 and just dancing next to the bands for free when you feel like it. The rest of the time you can pop into some of the bars along the parade route or make your way near the Savannah to see the groups preparing to go on stage. And anyway, as is the case with the full moon party in Thailand, the best parties are actually those that happen before the official celebrations. In Trinidad, one of the biggest fiestas is the J’Ouvert morning party. At 4 a.m. on Monday morning, thousands of people gather on the streets and cover each other with cocoa powder and paint and colorful powder. The end-result is a sticky mess, but it’s all good fun. My personal favorite was the Veil breakfast party, which started at 4 a.m. on Sunday morning and went on until noon the next day (yes, the Trinis do party 24/7 during carnival!). Not many parties are more fun than those where you dance outdoors to the beats of great Soca songs, and watch the sun rise out of the horizon. Finally at noon, sunburned and all partied-out, you get home and just crash. It’s then that you know that you’ve really made the most out of your carnival, like a true Trini. So, how was 2011 for you? Everyone was quiet for a little while, not knowing whether Matt really wanted a reply, or whether he was just getting ready to crack another one of his jokes. But it turned out he was asking it in all seriousness, and wanted a more profound answer than just “good”. Now, I don’t remember what any of us said, but I do remember how this one little question changed the tone of the entire conversation. Instead of the usual blabber, we each started to really think about the past 12 months, the dreams and wishes we had, and whether they had come true. For many of us, they had. 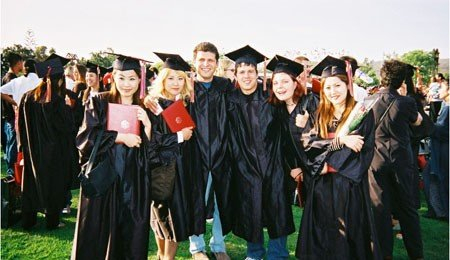 One of my big dreams had been to study in the US and that at least had come true. In asking his surprise question, Matt made me start a tradition. At the end of each year I like to take a moment to think about the year that went by: what I learned, what types of things I encountered, who I met and how I changed as a person. Back in 2004 I created a set of questions to measure my year. So I figured that today, the last day of 2011, is just the right time to answer those questions again. So here we go! -Hmm. That’s a tough one. I guess I’d have to give it a 9, as it was a nicely balanced year: I spent about a third of it it New York, another third in Finland, and the final third traveling the world. I met lots of lovely new people, reconnected with old friends around the globe, experienced amazing things (such as a flight over the rainforest in Guyana to visit one of the world’s most impressive waterfalls), had really interesting work opportunities and found inner peace. Well, maybe not quite, but almost! Hah. 2. What would you say was the best thing about 2011? 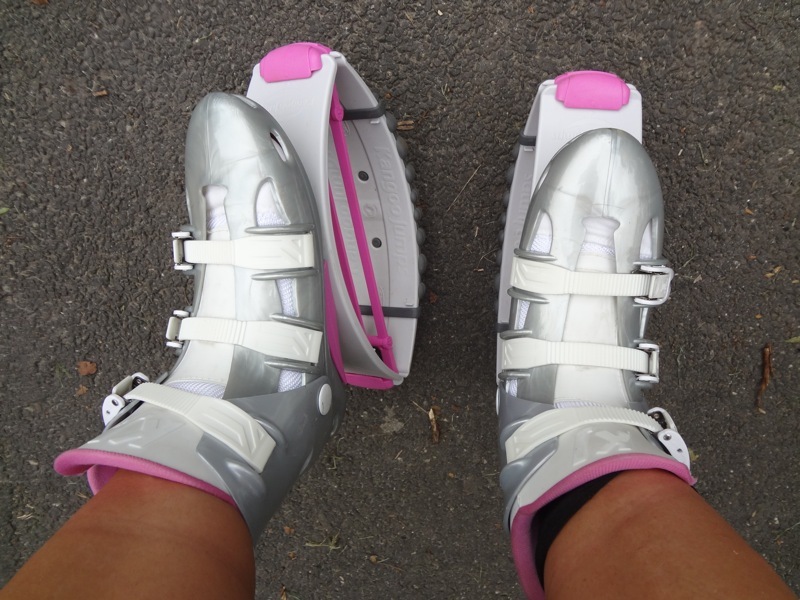 -Discovering Kangoo Jumps, the exercise shoes that make you bounce like a kangaroo! I first came across these funky shoes at a Kangoo aerobics class in New York in February. I instantly fell in love and bought a pair of my own through Mario The Trainer, the US guru of Kangoo Jumps. The reason why I love Kangoos so much is that I can’t help but smile every time I put them on and start bouncing. 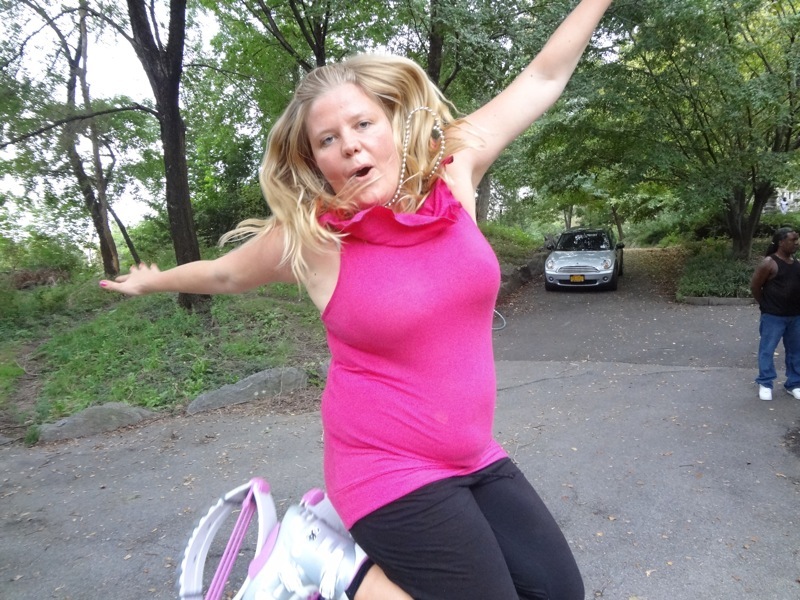 If I’m already happy, Kangoo Jumps make that happiness feel ten-fold. And if I’m feeling down, Kangoos make me forget about my worries. All that matters in the world at that moment is that I’m bouncing like a kangaroo and having a great time! Who needs depression medication when you’ve got Kangoos? 3. And the worst thing about 2011? -My dad encountered some major health problems, so that was definitely the worst news of the year for me. Luckily he is fine now (knock on wood!). In terms of the worst thing that I experienced myself – it would have to be getting my two bottom wisdom teeth taken out in surgery a few weeks ago. I spent my Christmas in a lot of pain and am still not fully recovered. I wouldn’t recommend that ordeal for anyone! 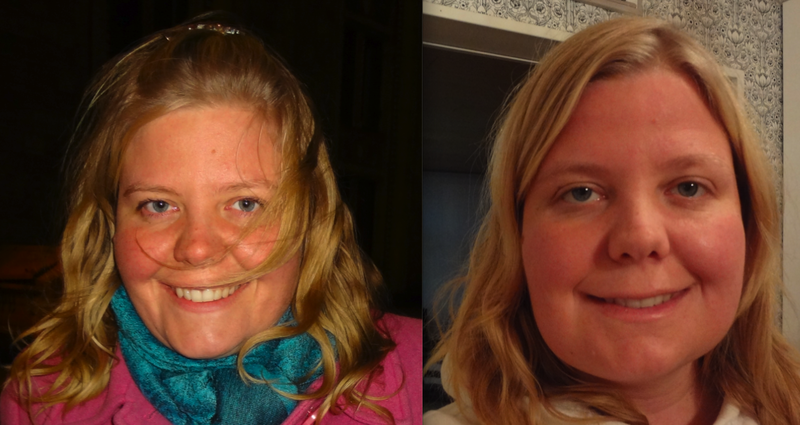 To serve as proof, take a look at my “human vs. hamster” photo, where you can see how swollen my jaw was afterwards compared to normal. 4. How was 2011 different from other years? 5. What song characterizes 2011 for you? Benjai’s Trini for sure! Bring on the carnival spirit! 6. What was the best party of 2011? A big thank you to my Trini friends for showing me how the islanders party it up! You have to see it to believe it. Besides the carnival partying, there were also some epic nights in New York, Havana, Guyana’s Georgetown, Warsaw and many other places. 7. Did 2011 bring any new favorites to you? Bands, movies, food, songs, cities…? So many! I loved all the Soca songs from carnival and I still listen to many of them weekly. Aside from Benjai’s Trini song that I mentioned above, I also grew to like this year’s Carnival Road March winner, Machel Montano’s Advantage. In the beginning of the carnival week I wasn’t a big fan, but then by the end of the week I was singing along to the frantic tune with everyone. After spending nearly a month in Cuba I was also converted into a huge fan of Reggaeton/Cubaton. This song was playing non-stop in Havana’s bars and streets and car radios. Another Spanish-language favorite is “Tu Angelito” by Chino y Nacho. It brings back so many memories of my unforgettable month in Cuba, and always makes me feel like dancing. I think I was probably a Latina in my previous life (although the fact that I’m totally salsa-challenged would speak against that…). 8. Did you travel anywhere in 2011? The question is more like where did I not travel to this year… I spent the first few months of the year home in New York, then took off on a tour of the Caribbean and Central America. 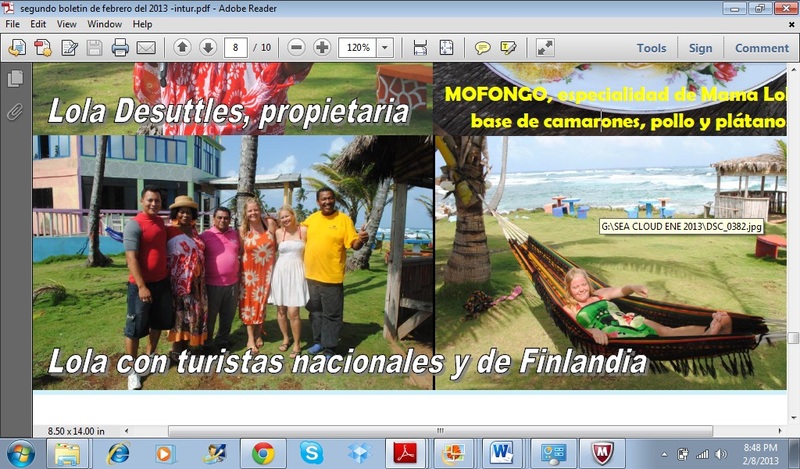 During the 2.5 months I visited Trinidad & Tobago, Guyana, Jamaica, Cuba, Mexico, Belize and Guatemala. The schedule may seem a bit rushed, but I had visited the last three of those countries before as well and only passed by Mexico and Belize quickly. Then it was back to New York for a bit, before taking off to Finland for the summer. In the end of the year I was selected as one of Finnair’s eight Quality Hunters, and thus spent the last few months of the year flying around the globe and blogging about it. I flew about 15 flights in seven weeks, so needless to say I was a little sick of planes and airports by the end of the project! Hah. During October and November, I visited India, Romania, Germany, the US, Japan, Poland and Holland. Thus for the month of December I decided to stay put in Finland and avoid all things related to traveling. But I’m over my travel exhaustion now and ready for new adventures in 2012! 9. Would you wish for 2012 to be anything like 2011? 10. So overall, how was 2011 for you? -Unforgettable, fun-filled, busy, challenging, ever-changing and full of surprises. No two months were alike but each month I had at least a few moments when I thought , “I’m really happy right now.” So it’s safe to say it was a great year! What about you guys? How was 2011 for you?